Boom. He did it again. 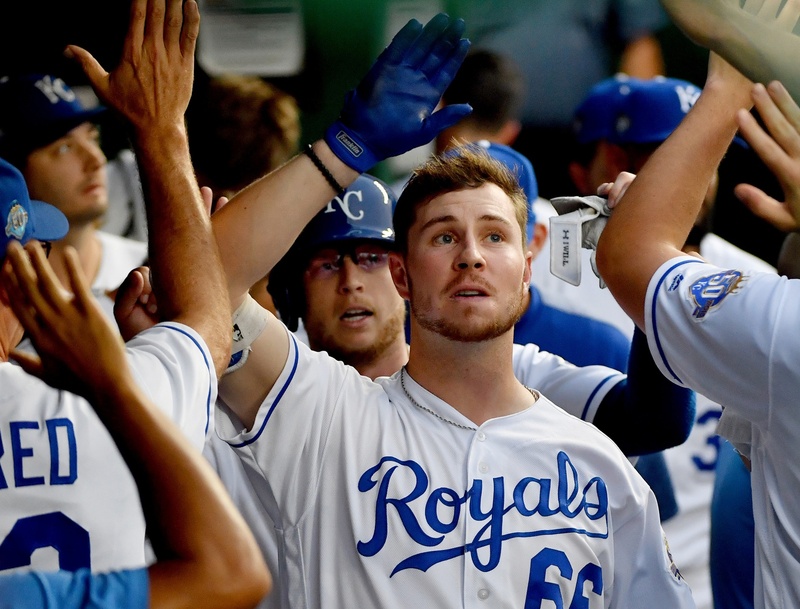 In a Royals season that was most notable for losses by the bushel, uninspired and uninteresting baseball, and a mammoth run differential, the year has suddenly become halfway sorta fun. It’s not must-see TV just yet. But we’ve come a long way from the pits of June and a dreadful first half of the season. Credit to the Baby Royals. The Process 2.0 is just getting started and there is absolutely zero guarantee that anyone on the field this month will be around when the Royals are ready to contend, but damn if this team hasn’t at least recaptured our interest. We’ve seen September promise before and been betrayed. The sample size and minor league track record of the group powering the current success still makes for a questionable future. For the last month, it’s been the Ryan O’Hearn show. O’Hearn has suited up for the big league club 30 times. He’s accumulated 113 plate appearances and crushed 10 home runs. The temptation is to extrapolate that dinger production out to a full season. You can manipulate the numbers however you like to bring O’Hearn’s total to around 50 homers if he played the entire year in Kansas City. Moustakas who and what home run record? Anyway, as noted in last night’s recap, the Royals trailed 3-2 in the bottom of the sixth when the Royals first baseman strode to the plate. White Sox starter Lucas Giolito missed on his first two pitches to allow O’Hearn to get ahead in the count. The third pitch was crushed. No surprise, the Statcast data was impressive. As noted above and it bears repeating, that’s 10 home runs in 30 games. That sort of run just isn’t supposed to happen. Not in Kansas City. Not for the Royals. Yet since his debut last month, O’Hearn has been stinging the ball. 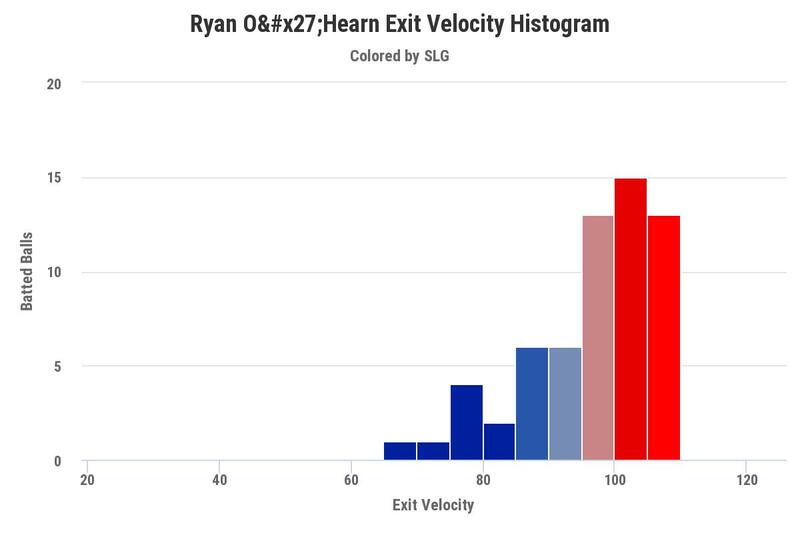 As you can tell from the histogram above, O’Hearn is consistently smashing the ball with an exit velocity usually greater than 95 mph. The bars are color coded by slugging percentage. For balls hit between 95 and 100 mph, O’Hearn is slugging .600. When his exit velocity is between 100 and 105 mph, it bumps up to an even 1.000. And 105-110 mph? How about a cool 2.462 slugging percentage. For you nerds (I write with love), his average exit velocity is 93.6 mph. That means O’Hearn is keeping some very exclusive exit velocity company. 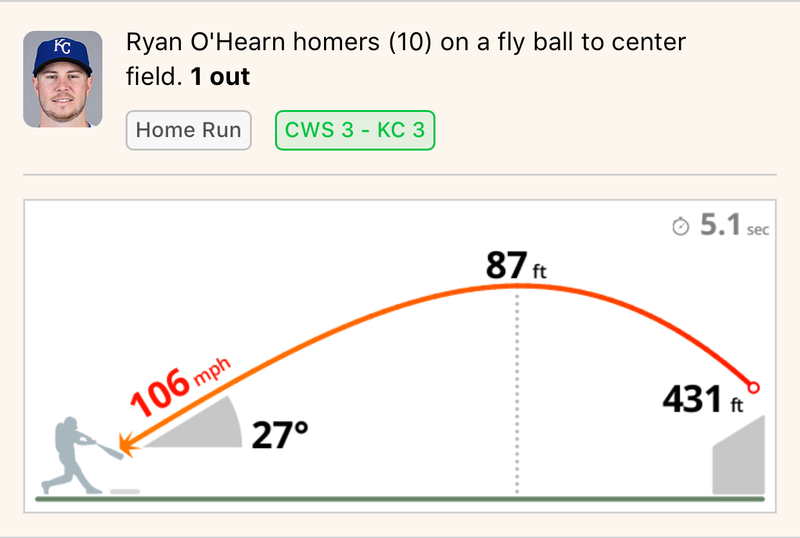 So when you learn O’Hearn barreled the ball at 106 mph on Monday, it seems a home run is really the only logical conclusion. Not even the spacious Kauffman Stadium can contain this prodigious bomb-hitting man-child at the moment. Let’s shift a moment to the location of the Giolito fastball. It was center-cut and on the upper edge of the strike zone. Guess what? If you offer O’Hearn a pitch in that spot, odds are damn strong he’s going to take a hack. 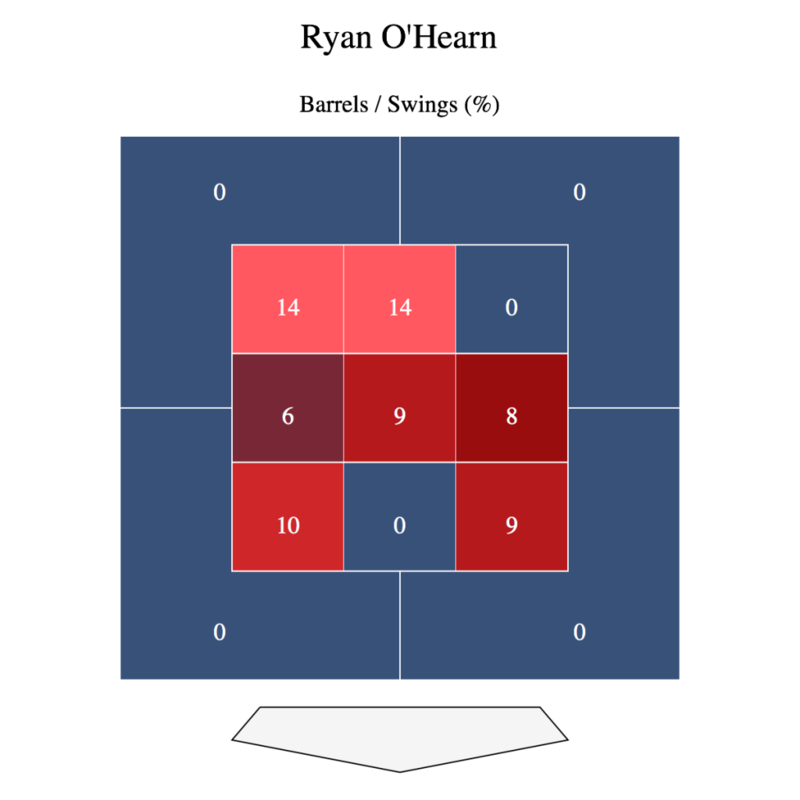 The Giolito fastball left his hand at 91.6 mph. It doesn’t have enough velocity or movement – there’s not enough speed or deception there – to prevent O’Hearn from taking advantage. Additionally, go back and watch the video of the homer. The catcher sets up low and away. Giolito missed his spot, and missed badly. It’s no surprise that O’Hearn likes the ball elevated in the zone. This is where he’s having the most success when it comes to making contact and “barreling” the baseball. Mistake or not, pitch him up and you’re entering the danger zone. This is where Statcast gets all kinds of fun. 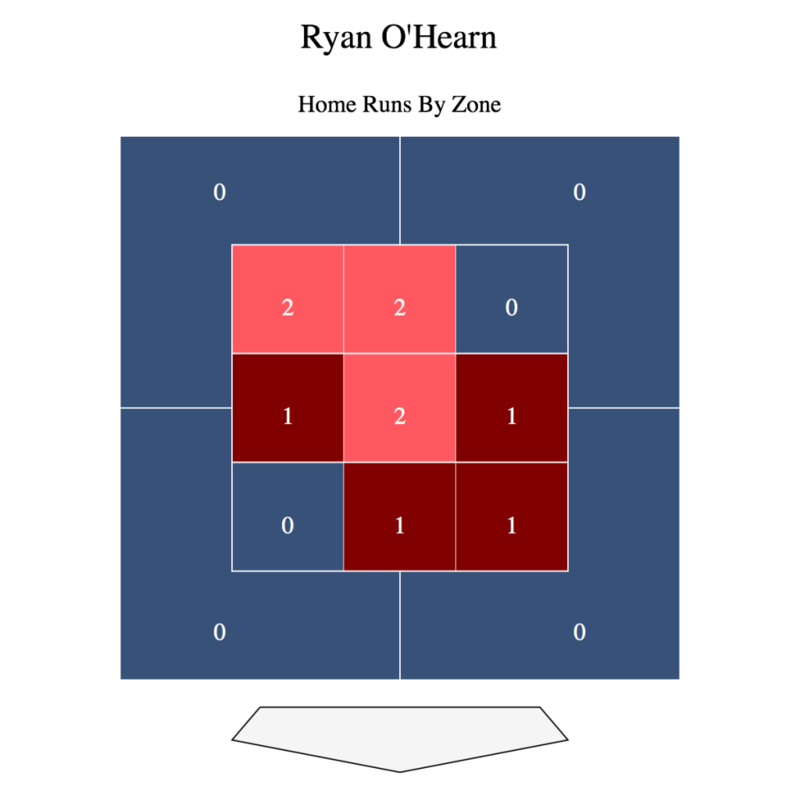 O’Hearn has put 12 balls in play in that upper middle quadrant, and despite the highest percentage of barrels per pitch in that area, he’s only collected three base hits. In addition to last night’s home run, he’s hit another home run and picked up his lone triple on a pitch in that neighborhood. That will help the slugging percentage. 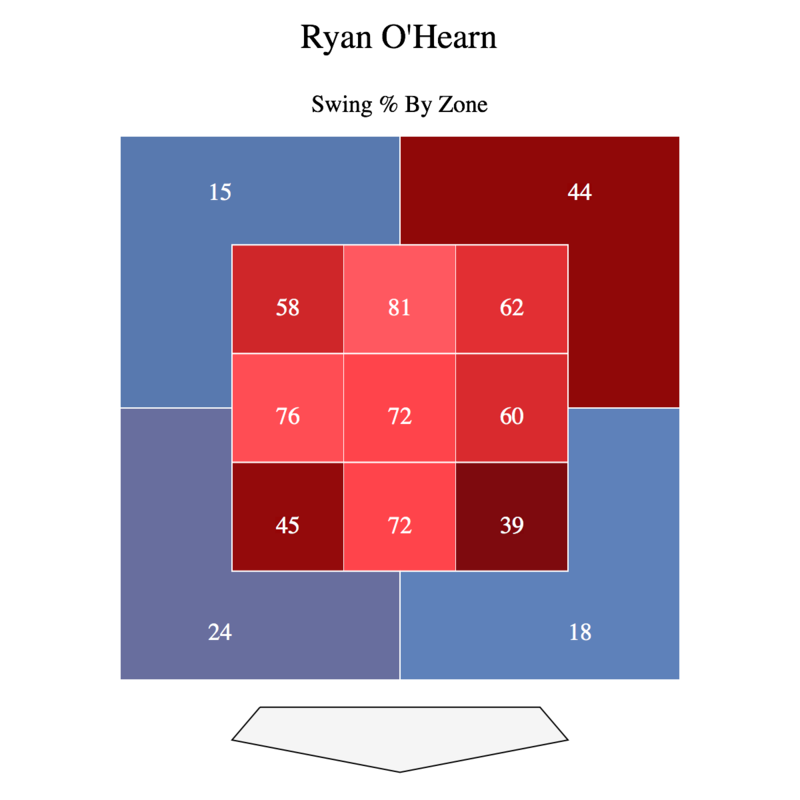 As we can see from his launch angles broken down by zones, there’s probably a good explanation for why the batting average is so low but the slugging percentage is so high. This is where you’ll find his highest average launch angle. 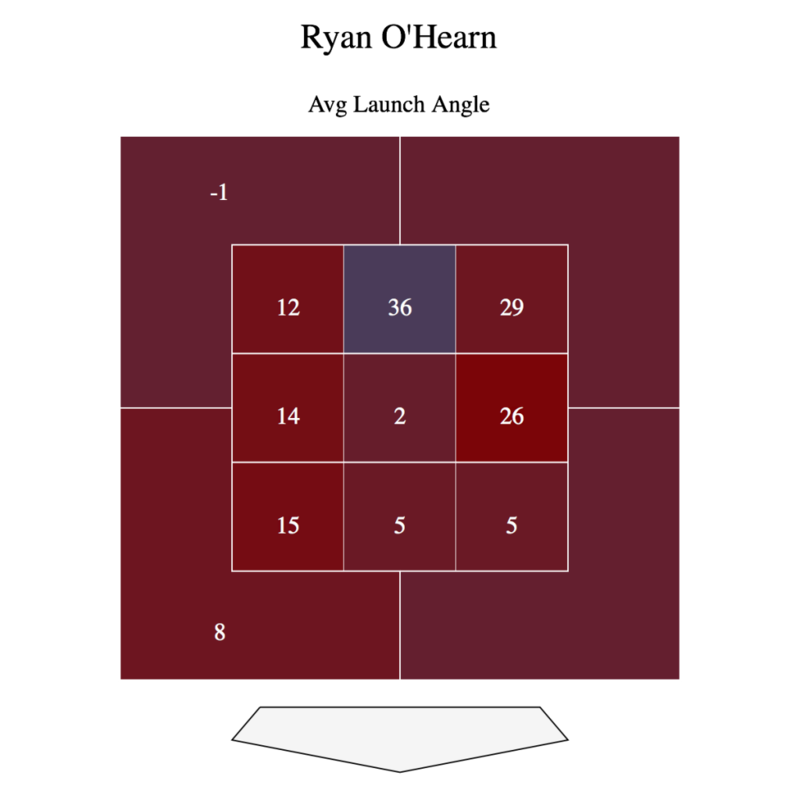 Indeed this one of the areas where he consistently gets the bat under the ball, which at least makes some kind of sense. Pitch him up and the baseball becomes a threat to cross orbits with the International Space Station. O’Hearn has put a total of 68 balls in play since joining the Royals. Although research has found the Statcast data normalizes earlier than most rate statitistics, O’Hearn’s numbers like launch angle, barrels and exit velocity are still in the process of stabilizing. Make concrete judgements off of 113 plate appearances and under 70 balls in play at your own risk. It’s still early days and with this being his first exposure to the major leagues, it’s far too early to say with any kind of certainty whether his success is sustainable. Pitchers will adjust. That’s guaranteed. It may not happen over the final three weeks of the schedule, but if he makes the team out of spring training, O’Hearn will undoubtedly find pitchers taking a somewhat different approach in trying to get him out in 2019. The question becomes, will O’Hearn make what amounts to a counter adjustment? Having said that, I’ll close with a chart from Baseball Savant that is reason for optimism. O’Hearn isn’t just hitting dingers on mistake pitches up in the zone. He’s hitting dingers on pitches damn near everywhere. Even in the small sample we can find some promise. It’s a strong introduction to a major league career. We are tantalized by the potential of a brighter future, but the hard work is yet to come. The challenge for O’Hearn will be to make the proper adjustments going into next season to capitalize on this success and to keep the dingers coming. At least we’ll have something to watch. Have not seen anyone write anything about his L/R Splits. 1-28 against LHPs. Concerning or small sample size? He’s never been particularly poor against lefties in the Minors.